Zip-lining is a great adventure for families that like to take in the sights from amazing and daring angles. The best zip-lining parks across USA traverse the volcanic grounds of Hawaii, The Rocky Mountains, and all kinds of terrain in the mid-west and east coast. Below are among the longest and most adventurous zip lines in the U.S.A.
Access this zipline adventure via a chairlift ride up Camelback Mountain and get ready for speed. Riders will be experience a 4,000 foot long zipline and reach speeds of up to 60 miles per hour on this incredible journey down the mountain and over a waterpark. What makes this zipline so unique is that it is technically a “Zip-Flyer” which means riders will basically be placed in a seat that is connected to the cable instead of the traditional harness. Alright, if you are heading to Hawaii lets face it, you’re going to have a trip of a lifetime, but lets take it up a notch. One of the longest ziplines in Hawaii is the Zipline Through Paradise. This 2,400 foot ride will have you soaring 160 feet over waterfalls and incredible nature (hence the name “Zipline Through Paradise.”. This is truly a thrilling option to take on that will be a highlight to your Hawaii adventures. We go from a Hawaii adventure to an Alaskan one. The Ziprider in Icy Strait Point Alaska checks all the thrill-seeker boxes. Icy Strait Point describes this ride as “an experience of a lifetime” and they aren’t wrong. With a length of 5,400 feet and riders reaching up to 65 miles per hour, this is truly a one of a kind experience. The 6 mile drive up to the top provides riders with views of whales and marine life before they arrive at the zipline towers and take off on a zip that won’t soon be forgotten. The Lost Canyon Zipline Tour may not be the longest or fastest of the zipline but it is definitely one that will get the adrenaline pumping. This journey has riders soaring over canyons and other incredible landscapes. After beginning operations in 2005 the accolades have already stacked up. Looking for a zipline experience that expands the boundaries of your typical zipline adventures. 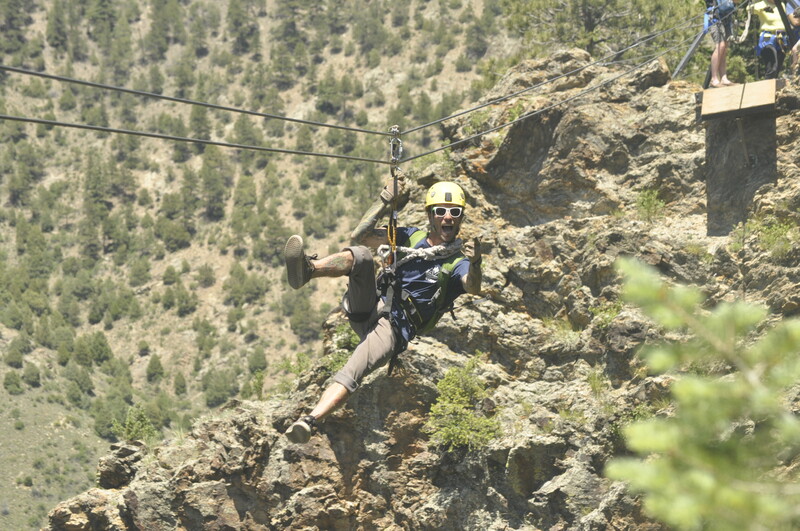 AVA’s Cliffside Zipline in Idaho Springs, Colorado not only has 6 ziplines that traverse along an incredible natural mountainside but it also offers so much more. A Jungle Bridge, “Surf Zip”, Bridge of Doom, 600-foot Dual Race Line, 50-Foot Cliffside Free Fall, and a total zipping distance of 2360 feet separates this adventure from the pack. This is a true Colorado experience that is sure to fulfill any thrill-seeker’s appetite. The New York Zipline Canopy Tours offers three different outdoor adventures; Sky Rider, Night Zip Tour, and Mid-Mountain zip. The Skyrider Tour is one of the longest, fastest, and highest ziplines in North America. It starts off with a scenic chairlift ride up to the top and a 3,200 feet long, 600 foot high insane ride back down. The Mid-Mountain Tour is a family friendly experience with incredible views of the Catskill Mountains. The night zip takes place on the Mid-Mountain Tour but underneath the stars. There truly is no experience quite like zipping under moonlight.